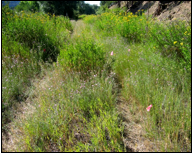 Herbicide field trials conducted near Missoula, Montana in 2006 and 2008 indicate that Opensight® at 2 to 3.3 oz product/A provided excellent control (>95%) of both common tansy and spotted knapweed 1 year after treatment (Figure 1). In the same study, metsulfuron methyl alone at 0.5 oz product/A provided excellent control of common tansy but no control of spotted knapweed. Application timing was late bud to flower on common tansy and late bolt to bud stage on spotted knapweed. Opensight® can be applied at 2 to 3.3 oz product/A to control houndstongue. At rosette to late bolt growth stage, Opensight provides good to excellent control (85 to 100%) at 2 to 2.5 ounces of product per acre. Control increases with increasing application rate. At bud to early flower growth stage, Opensight should be applied at 3.3 oz product/A to maximize control (Table 1). Data collected from multiple field trials in 2007 and 2008 show that Opensight at 2.5 to 3.3 oz/A provided excellent Canada thistle control one year after treatment (>90%) and was similar to Milestone at 5 fl oz/A (Figure 2). The addition of 2,4-D to Opensight did not improve control over Opensight alone. Metsulfuron alone at 0.5 oz product/A provided poor Canada thistle control. Applications were made to Canada thistle at the late bolt to early bud growth stage. Increased spectrum of weeds controlled without tank-mixing herbicides. Wide window of application including use in fall or autumn. Easy to measure and mix formulation. General use product (an applicator license not required). Use site include roadsides, natural areas (such as wildlife management areas, wildlife openings, wildlife habitats, recreation areas, campgrounds, trailheads, and trails), and grazed areas in and around these sites. Labeled for use in riparian areas, non-irrigation ditch banks, seasonally dry wetlands and can be applied up to the water's edge of areas such as ponds, streams, etc. Do not apply directly in water. Some states require an individual be licensed if involved in the recommendation, handling or application of any pesticide. Consult your local extension office for information regarding licensing requirements. Opensight and Milestone are not registered for sale or use in all states. Contact your state pesticide regulatory agency to determine if a product is registered for sale or use in your state. Always read and follow label directions. Consult the label before purchase or use for full details.